ePosters - The Atlantic Water boundary current north of Svalbard. 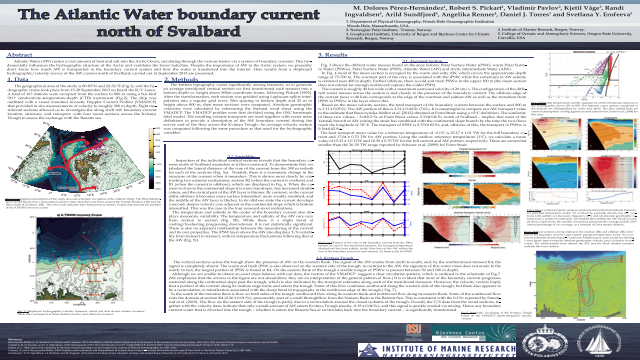 Poster Title: The Atlantic Water boundary current north of Svalbard. Abstract: Data from a shipboard hydrographic/velocity survey of the region north of Svalbard in the Nansen Basin are analyzed to characterize the Atlantic Water (AW) boundary current as it flows eastward along the continental slope. Eight meridional transects across the current, spanning an alongstream distance of 180 km, allow for a detailed description of the current and the regional water masses. During the survey the winds were light and there was no pack-ice. The mean section reveals that the boundary current is O(40 km) wide, surface-intensified, with a maximum velocity of 20 cm/s. Its mean transport during the survey was 3.11 ± 0.33 Sv, of which 2.31 ± 0.29 Sv is AW. This indicates that the two branches of AW entering the Arctic Ocean via Fram Strait – the Yermak Plateau branch and the Svalbard branch – have combined into a single current by 30oE. At this location the boundary current meanders with a systematic change in its kinematic structure during offshore excursions. A potential vorticity analysis indicates that the flow is baroclinically unstable, consistent with previous observations of AW anticyclones offshore of the current as well as the presence of a near-field cyclone in this data set. Our survey indicates that only a small portion of the boundary current is diverted into the Kvitøya Trough (0.17 ± 0.08 Sv), and that the AW temperature/salinity signal is quickly eroded within the trough.Summary: Atlantic Water (AW) carries a vast amount of heat and salt into the Arctic Ocean, circulating through the various basins via a system of boundary currents. This fun- damentally influences the hydrographic structure of the Arctic and ventilates the lower halocline. Here results from a shipboard hydrographic/velocity survey of the AW current north of Svalbard, carried out in September 2013 are presented.References: Beszczynska-Möller, A., E. Fahrbach, U. Schauer, and E. Hansen, 2012: Variability in Atlantic water temperature and transport at the entrance to the Arctic Ocean, 1997-2010. ICES Journal of Marine Science: Journal du Conseil, fss056. Cokelet, E. D., N. Tervalon, and J. G. Bellingham, 2008: Hydrography of the West Spitsbergen Current, Svalbard Branch: Autumn 2001. Journal of Geophysical Research: Oceans (1978--2012), 113. Pickart, R. S., 1992: Space-time variability of the deep western boundary current oxygen core. Journal of Physical Oceanography, 22, 1047–1061. Schauer, U., and A. Beszczynska-Möller, 2009: Problems with estimation and interpretation of oceanic heat transport--conceptual remarks for the case of Fram Strait in the Arctic Ocean. Ocean Sci, 5, 487–494.